Tony Lawrence's Coins & Stuff: Errors and die varieties - new 2014 DDO in your change? Errors and die varieties - new 2014 DDO in your change? Collecting die varieties and errors is a wide ranging field. 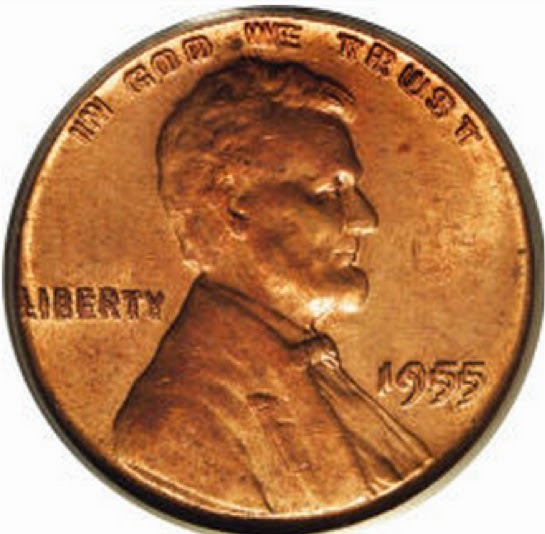 Although it includes spectacular coins like the 1955/55 DDO Lincoln Cent, it also encompasses small distinctions like the size of berries on the reverse of a half cent, die clashes and more. Some varieties are so minor that only the most dedicated collectors are interested. You might need a microscope and a lot of experience to even realize that a particular coin was a variety like that. It's also easy for inexperienced collectors to be fooled by PMD (post mint damage) and worthless MD (machine doubling). There's a fairly easy to spot variety of 2014 cents that you might very well find in your change today. It's not as spectacular as the famous 1955 double die, but it is recognizable. The date and some other lettering are "fat". You probably could see it with your naked eye at least well enough to sense that something is wrong, but a low powered magnifier would help. An example of that recently sold on eBay for $60. but as it's too early to say how many of these exist or what the market will ultimately bear, we don't know if that's a high price or a low price.